Michael: Our progression and scale will be in the A Dorian mode, here's the scale pattern. 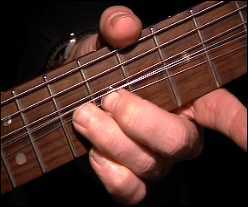 Michael: This is a common type lick Carlos would use, notice it starts on the upper position of the Dorian mode, based on the 10th fret. You start with your first finger on the 2nd string and jump to the 1st string and then you bend that string. Michael: Then you move to the higher position and finally play a common unison bend lick he often uses, a "Unison Bend" looks basically like this. semr: The open G string is sounding after I bend the B string. How can I stop that? 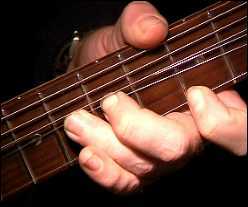 Michael: I use my 3rd finger to mute the string above it, I'll send a picture. DGnew: Tell me something... the jam is in the key of Am right? and this lick is a pentatonic. . no?? Michael: Here's how they layer, A minor has A, B, C, D, E, F ,G - A Minor Pentatonic has A, C, D, E, G, so you remove the 2nd and 6th note. The same goes for the A Dorian, only it has an F# instead of the F in the A Minor scale. OK, now you can take the Unison Bend technique and ascend the scale pattern as well on the 1st string. DGnew: So... just one more question: which are the common notes that Santana add to the pentatonic scale? Michael: Santana will use the A Minor Pentatonic, the A Minor Blues and the A Dorian mode mostly. Here's both the two patterns. Michael: You have to get use to shifting your hand up on the last unison bend and matching the notes as they ascend. Here's our next lick. Michael: Notice the trill run descending the scale pattern on the 1st string E, Carlos uses trill quite a bit. 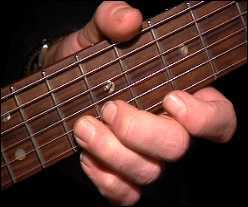 The lick then shifts to the unison bend based on the 5th fret and then ends using the notes of the Dorian on the 1st string. The trills and unison bends are signature to the Carlos sound. 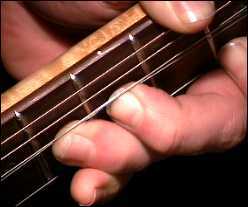 The next lick uses several of the techniques I showed earlier, Dorian mode, unison bend up the 1st string, the unison bend on the 12th fret (unison bend 2). Michael: See how they all fit together, you can also take the same scale pattern and use a hammer/pull-off lick ascending the pattern as well. Michael: Knowing these techniques will allow you to figure out Santana songs on your own. sr: I'll work on it. Michael: Great, see you next lesson!